My days of large full tower cases are slowly coming to an end. Although I love the behemoths of yesteryear, I see myself starting to look upon Mini-ITX motherboards and cases with more enthusiasm every day. I can get everything I want and need in a compact platform without sacrificing CPU and video card power. This transition seems to have been born from the latest round of case reviews that have been featured here lately. We have featured SilverStone, Fractal Design, Lian-Li and iStarUSA cases on the site but one company wasn’t feeling any love and promised me they could sway me from the others with their latest Mini-ITX case. I have to admit, the competition is rough, but Antec feels as though their ISK600 is the case that steals the thunder. 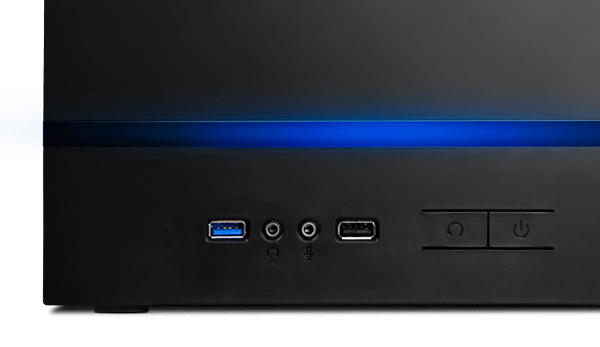 The ISK600 is a slick looking and versatile Mini-ITX case capable of stuffing some impressively massive components within. First, the ISK600 measures in at 195mm (H) x 260mm (W) x 369mm (D) and weighs next to nothing when empty, just 6.5 lbs. The case can support plenty of storage by allowing you to install a total of 6 devices: 1 Slim Optical Drive, 2 x 2.5″ HDDs, and 3 x 3.5″ HDDs. Aside from the plentiful storage options, the ISK600 can home a massive (317.5 mm) video card and CPU Cooler (170mm in height). The case ships with an Antec 120mm fluid dynamic bearing fan (1200 r.p.m, 18dB) installed in the rear, it has 1 USB 2.0 and 1 USB 3.0 ports up front, as well as Audio In/Out. The ISK600 is manufactured from 8mm SECC steel and plastic. It features some advanced cooling capabilities (ready for water) as well as the ability to accommodate a standard ATX PSU. The stylish and sturdy finish can make itself feel comfortable in any environment and its front facing blue LED strip ensures that you have at least the 37 pieces of flair that the management requires.